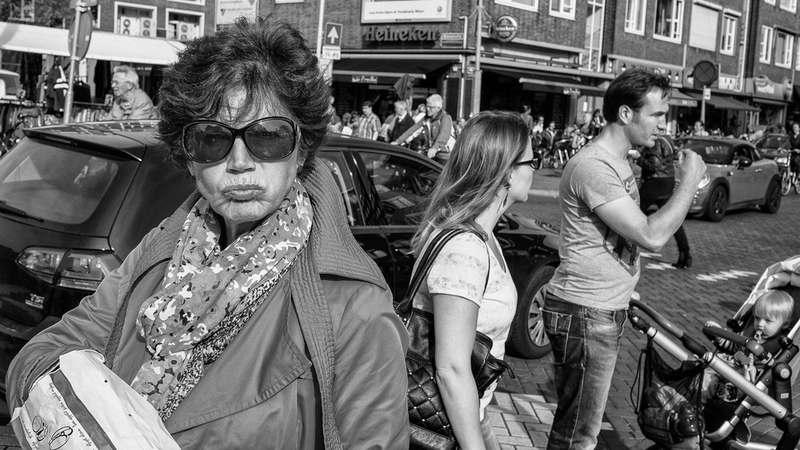 Although I like people giving me 'The Eye' as most people who follow me know, staying invisible is crucial in street photography. Especially before taking the shot... There are a few methods I use to accomplish just that and thought it would be a nice subject for my April blog. Most of the time I just use auto focus, but you can also use manual zone focussing techniques. Just set your lens at 2 meters (6 ft) for example, learn to estimate your apperture and wait until your subject is within that range. Then take the shot... Everything within that range will be sharp. Needless to say to set your shutter speed at 1/250 minimum (I prefer 1/400 or higher) if you don't want motion in your shot. Many photographers just want to be unnoticed for obvious reasons. But by trying too hard, acting nervous and being anctious to get that shot and get the hell out, you will get noticed. If I just hang out on a street corner, people will not notice me after a while. At least not conciously... Interesting things can happen like people bumping into each other, people meeting someone they know, people crossing the streets or whatever. If I see someone interesting walking in my direction, I'll just wait and look beyond them. Then I act like I'm photographing something else and take the shot. Wait until they've almost passed and then I pretend to shoot in that direction again. Never ever make eye contact on this one! They will know or at least suspect that you photographed them. The image on the right shows that style.. I saw her coming from a distance eating and putting her mouth full of food. I just framed and kept my cam before my face. Luckily there was interaction with the camera which makes it more interesting. - You need a lens of about 18mm, because that gives no distortions. - You have to hold the camera at an angle of about 45 degrees upward if you shoot close by. - I mostly use ISO 800. Your camera must be fast (at least 1/125), because there is always some movement. - You should not look at the person nor at your camera. - And yes, practice makes perfect !! Thus, using the thigh-shot technique makes you invisible and you can get hardly any closer to the subject. Finally, the two “Walk By” pictures are done in a sequence. I shot several times while walking along the cop. Meanwhile, I was busy adjusting my hand posture and was focused on the position of my hand in relation to the cop all the time. Btw, I shot dozens of cops this way and never been busted. So it seems to work! Hope to have given you some insights and inspiration!